Having received free admission to the AncestryDNA Beta and gained some knowledge as a result, I feel obliged to offer a review of the service. Through my father, I expected my genetic ancestry to be about 47% British Isles, 3% Dutch. Some portion of my British genes might in fact be Scandinavian, due to the notoriously indiscriminate dating practices of Vikings. But barring some non-paternity hanky panky not reflected in the records or family tradition, my father's heritage is pretty well settled. WTF! Pardon my French, but . . . where's the French? Let's say my paternal ancestry accounts for the 36% British Isles, maybe 3% of the Uncertain, and perhaps 11% of the Scandinavian. (My scant Dutch ancestry might have been classified as Uncertain, or else misidentified as British Isles; Vikings also left some genetic traces in the Netherlands.) That leaves me with a maternal genetic ancestry which is 16% Finnish and maybe 31% Scandinavian, 3% Uncertain. Which leaves me uncertain who the hell that guy was that I used to call "Grampa." My French grandfather wasn't French. The test results are wrong. Not likely. He didn't often speak French, but he did curse in French. He was born in Presque Isle in northern Maine, and all of his known ancestors came through the French regions of New Brunswick and Quebec. He was either French or the mastermind of a very elaborate hoax. Possibly. AncestryDNA is still in Beta, so refinements and improvements can be expected. But could they have mislabeled a quarter of my genetic makeup? Could my French genes somehow have been misidentified as Scandinavian and/or British? Others have been surprised by the nonFrenchness of their AncestryDNA results, and many have noted an apparent overestimation of Scandinavian ancestry. So maybe when the Francophobic Viking lover in AncestryDNA's laboratory is discovered and fired I'll get fresh results that will again make my grandfather French. Well, Grampa fooled around, but that's not relevant to this discussion. When I told my mother about the test results, she was unexpectedly pleased. She had always felt more Finnish than French, and the percentages do suggest that her biological father could have been Finnish/Scandinavian. (If her mother did fool around, it was probably with another Finn.) Her siblings looked more French than she ever did. She is now on the waiting list for a $99 AncestryDNA test of her own, which she hopes will confirm that she is 100% Finnish/Scandinavian. Once she has those results (and after we've given AncestryDNA some time to refine its process), she'll broach the subject with her maternal aunt—likely the only person alive with knowledge of any possible extramarital activity. I join the chorus asking that AncestryDNA make raw data available and test results portable, i.e. let users export their data and upload it to third-party sites. The graphs and maps are pretty and all, but some users want to get under the hood and get their hands dirty. Being matched with a previously unknown fifth cousin and finding that our pedigrees intersect gives me some confidence that the science behind AncestryDNA is sound. But allowing experienced genetic genealogists to compare the raw data from this and other tests would go a long way toward establishing widespread confidence in a service that is, so far, a black box. *I have been offered 6 months free access to "Ancestry Connections" which would allow me to contact them, but will paying customers be offered this deal as the service moves out of Beta? I can understand restricting access to member trees and other features, but shouldn't potential cousins be allowed to make contact without continued contributions to Ancestry.com's bottom line? Very interesting analysis. Good to see you blogging again! Chris, how long did it take to get the results? A few months. But that was during the early Beta stage. Nice to see you back, Chris. Looking forward to hearing the outcome of your missing family! Bear in mind that your DNA originated generations before your grandparents or even great-grandparents. My recent ancestry is mostly British Isles but many of the people there originally came from central Europe and Scandinavia, which is what my DNA results reflected. The family tree of one of my close matches shows that she too had a French grandfather, from the same small region of New Brunswick that my grandfather's ancestors came from. She and my grandfather have several surnames in common, and their ancestors drew from the same French gene pool for a couple hundred years. But AncestryDNA shows her ethnicity as 27% Central European, and my ethnicity as 0% Central European. This adds to my suspicions that the test is fairly accurate, and that my French grandfather was not my biological grandfather. My mom feels the same way: that she should have seen it coming. She always felt that her father treated her differently than he did her siblings. Though she was close to some members of her father's family, she always felt drawn more to her Finnish heritage. If true, this would help her make sense of her whole childhood. I had a Y-DNA test done by another company earlier this year hoping to get some answers on my West brickwall and all I got was confused. Glad to see you back blogging, cousin.No fair hogging all the funny genes and not using them! I would be surprised that anyone would get French in an ancestry breakup. The French are the nexus between North and South Europeans, neither and both. It is quite possible your "French" is mostly North European. I was confused at first as to me a French person is someone born in France not the New World. Once people leave their original countries hundreds of years ago, who knows with whom their descendants mixed with in the New World. A lot of paper trails are hooey. Finns are outliers in Europe, not really Scandinavians but a rather genetically drifted European ethnic group. As they say in Australia, the Finns stick out like dog's balls in any MDS/PCA plots on the edge heading east towards Siberia. Very interesting. While the "grandma fooled around too" hypothesis is certainly both plausible and entertaining, he left off one possibility. If his grandpa was from northern France, he may actually be Celtic, which raises the possibility that he was misclassified as "British Isles." My question to the ancestry people is this: Does your database have enough detail to distinguish between French Celtic and British Isles Celtic? My grandfather was French Canadian, the descendant of dozens of French families that had lived in Quebec and New Brunswick for centuries. It's likely that his genes originated in several different regions in France, and were not drawn solely from Celtic and Scandinavian sources. The fact that I have 0% Central European ancestry, while one of my AncestryDNA matches—whose grandfather came from the same area in New Brunswick as mine—has 27% Central European ancestry, strongly suggests that my grandfather was not my biological grandfather. Ok so maybe his French blood is really Normandy blood. Lest we ever forget in our complacent world of long forgotten conquering Tribes. Good Luck. When my dad did a DNA test of his maternal side it was nothing we expected. Just new ways to think of who really is my Ancestors? My mother's side of the family is French Canadian, originating from France. I, too, had no French in my AncestryDNA results and a whopping 25% Scandinavian (to go along with the British Isles). 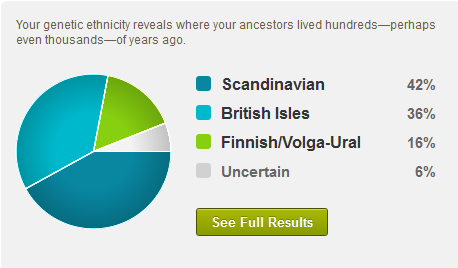 I also took the ancestry.com beta test and was very surprised when the results came back that I was 99% Scandinavian! ?!?! 99%! How is that even possible? I have several German immigrant ancestors - is that Scandinavian? Still trying to understand that. I sent a message to ancestry.com but they haven't responded. Thanks for your review. One thing to remember is that DNA is not passed from generation to generation in exact proportion. If your mom is 1/2 Irish and 1/2 Italian, you will not necessarily inherit 1/4 Irish and 1/4 Italian DNA. The way DNA is broken up and redistributed among reproductive cells makes it possible for you to inherit any combination of Irish & Italian DNA, up to 50% total. In my example, you might inherit only Irish or Italian DNA and end up 50% of one and none of the other. This would explain why you have no evidence of French DNA from your grandfather. The genes you got from your mother may have only contained DNA inherited from her mother and none of the DNA she inherited from her father. I'm having my mother take an autosomal test of her own to rule out that unlikely scenario. That also doesn't explain why my 1/2 French is totally missing! I would love to have my mother take the test and see how she comes out. Hmm, interesting. My mom sent in her DNA sample on Monday, so we'll soon have some more data to work with. Rapsg is right! You dont get EXACTLY half of what each parent has. If your mother is half French, you could get none of that dna. And there is no pure ethnicity, so it would be impossible that your grandfather is 100% French. Your mother could have gotten a small amount or none of the actual French DNA, giving you an even smaller chance of receiving it. I also just recieved my ancestry DNA, which said my ancestry was 93% from the British Isles and 7% uncertain. Like you, I know for a fact my maternal grandmother's family was French Canadian, originally from Lower Normandy. I was surprised there was no French in my DNA. However, there is a lot of different ethnicities in modern France. Plus my grandmother's surname, Goulet, was apparently a Breton surname. So it is possible their ancestors actually were from the British Isles. I see that you have a lot of Scandinavian DNA, so perhaps your ancestors were Normans, who were actually French speaking Vikings. I have my family history going back through paternal and maternal lines back to the 1700's. Ancestry.comm DNA's analysis does not show my British ancestry. It labels me as 85% Scandinavian. My brother had his done at 23 and me with a much more detailed chart. His results and my results are off. I have no known Scandanavian ancestors back as far as 1700. There is great history about Jews in Spain before and after the Crusades.